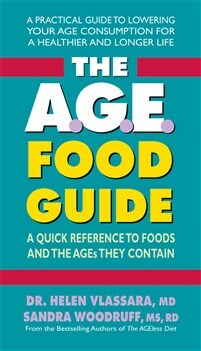 All foods contain AGEs—advanced glycation end products—which are naturally occurring toxins. Numerous studies have shown that a buildup of AGEs accelerates the body’s aging process. Over time, by increasing oxidation and free radicals, hardening tissue, and creating chronic inflammation, AGEs lead to a host of chronic diseases. By knowing how to lower your AGE consumption, you can lead a longer, healthier life. Here is an easy-to-use guide to understanding AGEs and identifying those foods that have the least AGEs and those that have the most so that you can make smart dietary decisions.